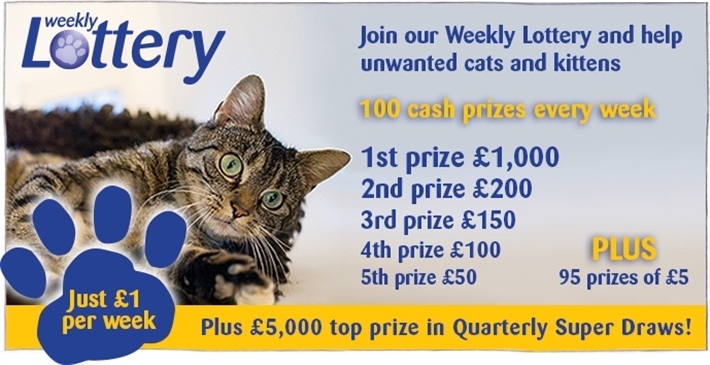 Please help support us by joining the weekly Cat's Protection Lottery. Our weekly lottery started in June 2013. For just £1 per play there is a chance to win cash prizes, you can enter more than once if they want to increase your chance of winning! The winners are drawn every Friday and are published on the Cats Protection website at www.cats.org.uk/lottery. And 95 runner-up prizes of £5 every week! As well as being in with a chance of winning all of these prizes, we also automatically enter players into a quarterly SuperDraw, where we increase the first prize to £5,000 cash. In addition to the prizes you could win for yourself, you will also be putting our Adoption Centre in with a chance of winning a Pets@Home card worth £450.00! You can now enter the Cats Protection Lottery online – Just complete the form and you can pay online also. Please remember to put Wrexham in the branch/centre name box when completing your lottery form so that any money generated will come back to our Adoption Centre. Whether you win or not, you'll be supporting a great cause. You can also enter by calling our Weekly Lottery Helpline on 01628 825 928 or download our lottery form and post to: Freepost RTJY-JUCB-AATE, Cats Protection, PO Box 1127, MAIDENHEAD, SL6 3LN. Click here for full terms and conditions.